Online Baccarat is derived from Chemin De Fer or Baccarat en Banque, one of Europe's oldest and most popular card games. It is a high-limit game, from which casinos developed a game for lower-limit players called mini-baccarat. Our online Baccarat is very easy to play. 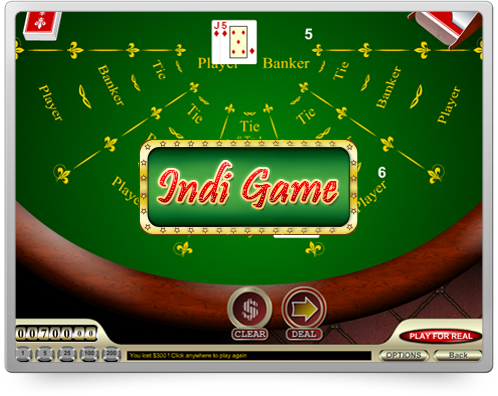 The dealer handles the draw of cards according to specific rules and, as in Roulette or Craps, the player has no decisions to make during the game. The only two decisions a bettor must make, before each hand is dealt, are selection of the position he or she believes will win the next hand, and determining the amount of the wager. The House banks all bets, and collects or makes payouts on each hand that is dealt. However, it is a good idea to be familiar with the rules, as it will heighten the enjoyment of the game, and the anticipation of the turn of a card. Overall, Baccarat is one of the best games in the Online Casino for the bettor. To wager on the hand that will finish with a point total of 9, or as close to it as possible. You may wager on either the Banker hand or the Player hand, or on a Tie bet. All tens and picture cards equal zero. The Ace's equals to 1. All other cards count as their face value. If the value of cards exceed 9, then the hand value is adjusted by subtracting 10 from the total. A few examples are displayed in the chart below. There are 6 52-card decks in Baccarat of Epoch Casino. The decks are shuffled after each hand. The cards are dealt from a shoe, similar to Blackjack. You can bet on either the Player's side, the Banker's side, or on a Tie. Four cards are dealt, the first and third to the Player's hand, the second and fourth to the Banker's hand. The point total of both hands is presented below. If either hand totals 8 or 9, each of these numbers is called a "Natural", then no additional cards are dealt. The winning hand is the one with a point total closest to 9. When both hands have equal totals, a "Tie" is declared. Depending on the points accumulated by each hand after the initial draw, the dealer may need to deal a third card. It is drawn face up, first to the Player's hand and then, if necessary, to the Banker's hand. No more than one additional card per hand may be dealt. The drawing of the third card is governed by the following fixed rules. If either Player hand or Banker hand totals 8-9, the hand is called "Natural". In this case, both the Player and the Banker must stzand. If the Player hand stands on two cards then a two card Banker hand totaling 3,4,5 must draw and a Banker hand totalling 6 must stand. After the Player hand is dealt a third card, Banker hand receives a third card according to the chart below. If the hand that you bet on wins, you are paid 1 to 1. If you bet on a Tie, you are paid 8 to 1. Please note that the House charges a 5% commission on all winning Bank wagers. The commission is deducted immediately upon payment of the winnings. For example, if you bet $5 on the Banker hand, and the Banker hand wins, you will get your $5 bet back, plus another $4.75 ($5 minus $0.25). You may turn on/off the Tips, Sound and Music during the game by clicking on the "Options" button located in the lower right-hand area of the console. The option is turned on when the checkbox is checked and it is turned off when the checkbox is unchecked. To buy online Baccarat casino game solution, please contact our sales representative.